Updated and expanded, this best-selling 1995 guide is back with new text, photography, and an entirely new section focusing on the unique collection of Frank Lloyd Wright-designed homes in the Buffalo area. 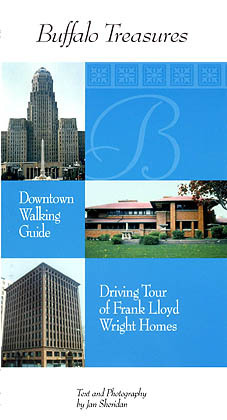 The first section of this informative volume is a walking tour of 25 major buildings in Buffalo's historic downtown neighborhood. The easy-to-follow guide compresses information into a pocket-size guide that would take between two and four hours to actually visit. But if you're planning to spend an afternoon in Buffalo, this is the ideal companion for the more adventurous tourist. This new edition also features a driving tour of the area's Frank Lloyd Wright homes. It begins with the national historic landmark, the Darwin D. Martin House, and concludes in Derby at Graycliff, the 1927 summer home Wright designed for the Martins. Authored and photographed by historian Jan Sheridan, Buffalo Treasures includes a map with all the sites clearly numbered, photgraphs and addresses of landmark buildings and short descriptions which shed light on each structure's history and architecture.